It’s the last day of the summer holidays and I’m feeling sad that it’s all drawing to a close. Things for us all are going to change a lot in the next month (more on that another time). And though we all do well with a bit of structure around here the chance to play, relax and just be together has been wonderful. My boys are, after all this time, firmly attached and entrenched siblings. And as with every sibling relationship there is a lot of love together with annoyance, frustration, screaming and in spite of their ages, mutual respect. 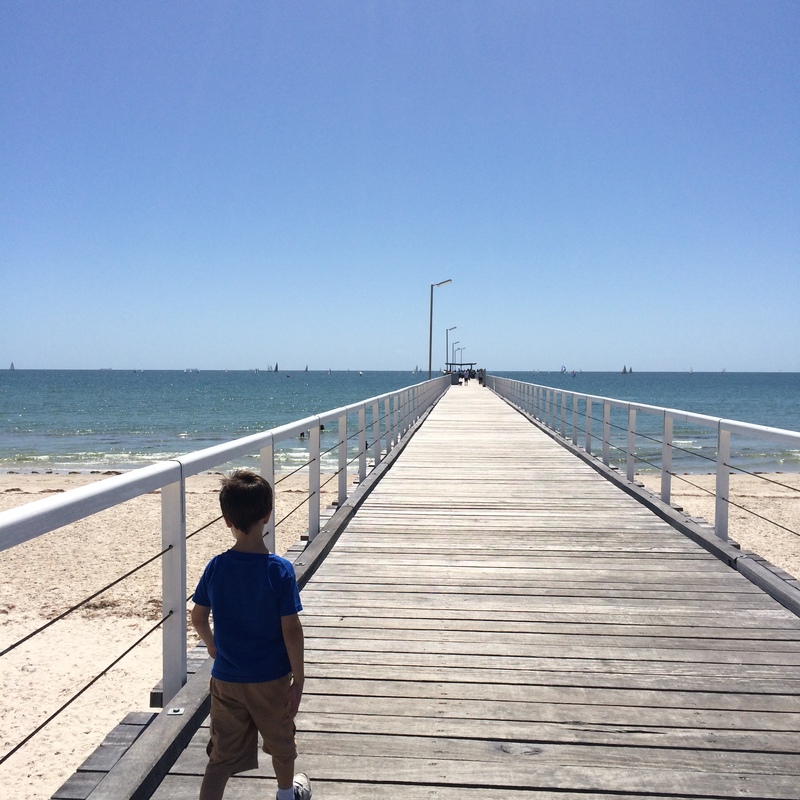 Yesterday Mr 6 remarked that the summer has been his best yet, bless him. We took the foot off the pedal a bit and relaxed our pace and in so doing created opportunity for us all to be a family. To let the boys be kiddos, get dirty, do things at their own pace. It’s worked too and I sense they’re energised and refuelled for the year ahead. There have been some beautiful memories….like this….. When we read this, Mr 6 looked up at me and said, “Woah Mum, that sounds like the way you talk.” which is quite the compliment but maybe reading things like this is part of the reason I do, in a way, talk like this. It’s a pleasure of parenthood to weave your own childhood loves through the narrative of your own children’s lives which is what I do with books and food. That’s easy for me to do with my beautiful firstborn as he is so like me in many ways. And in thinking about the year ahead this week I got my baking back on to prepare for the return to school days. Mr 6 is as much of a fan of breakfast as I am (which is to say he isn’t!) 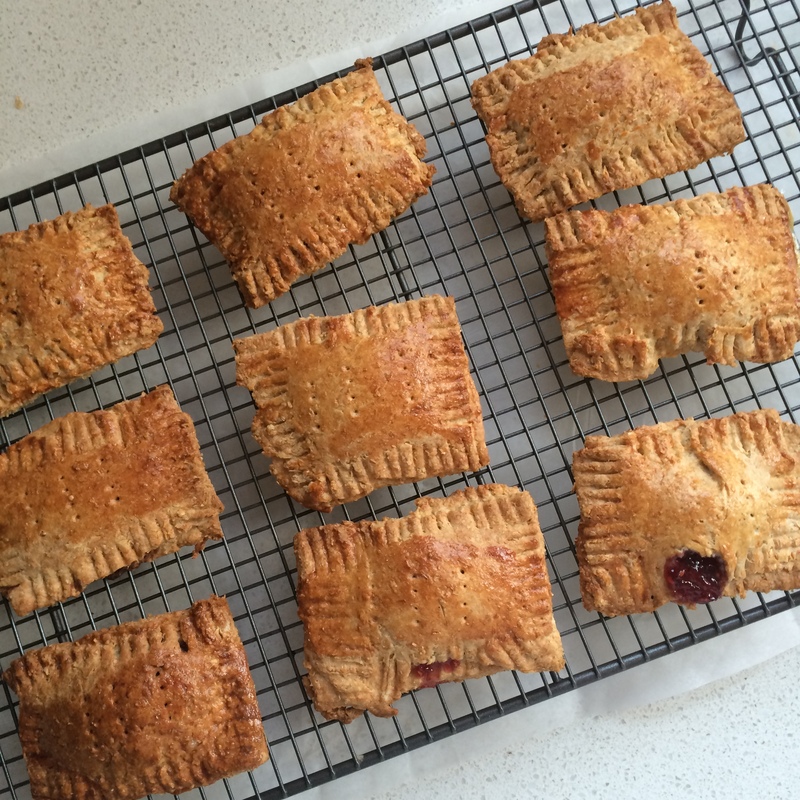 so when I spied these homemade pop tarts from My Whole Food Life I wanted to give them a try. My kiddos are pretty good with healthy versions of not so healthy things like pop tarts (especially as they’ve never tried the original!) but I knew a hybrid of healthy and not would work best so I combined the original recipe with this one from Smitten Kitchen (which by the way is a blog that never steers me wrong). Combine flour, cinnamon and coconut butter in a large-ish bowl, when it comes together add in the honey and egg and knead the dough (I kneaded in the bowl but whatever you like). You could do this in a food processor but I couldn’t be bothered washing mine so did it by hand, it didn’t take long. Cut the dough in pretty even rectangle shapes – you need to have enough to make a top and a bottom – I think mine were around the 7 cm by 5 cm mark. Try not to eat them the minute they come from the oven! This entry was posted in Uncategorized and tagged family, food, love, mamahood, recipes on January 26, 2015 by catbeloverly. Well my reading year is off to a smashing start thanks to the truly delightful, “Brother of the More Famous Jack” written by Barbara Trapido (you can grab it here). Also, I’ve ticked one off the reading challenge list….this one I chose almost solely on it’s cover (you can see it by clicking the link above), 1 down, 51 to go. Katherine Browne is one of the best drawn female characters I’ve read in a very long time and spending time with her was a joy. Katherine falls in love, loses love, loses herself, tries out different ways of being in the world, moves to Rome, falls in lust, loses everything and eventually she comes home to her kindred spirits by way of the Goldman family. She falls in love again, this time it’s the real thing and she finds happiness. It’s a coming of age story in a way – perhaps more of a coming in to herself story. Jacob Goldman is Kath’s Professor and she is drawn in to his personal orbit where he and his wife Jane are a formidable duo. She is accepted as a member of their family almost instantly and it is clear these people are her tribe. This family is so unlike her own…where beauty is appreciated, verbal sparring is the everyday and intelligence is respected above all else. But there is kindness, respect and love here too. Roger Goldman, the oldest son, reminded me so of someone I used to know….and I winced with Katherine’s heartbreak and fawning as I saw echoes of my own past behaviour. The writing is light and clever and for me a highlight is the genuine friendship between Jane and Katherine. One borne of shared values, respect. They are the type of friends who see each other for who they really are and don’t expect otherwise. A fun, beautiful, heartfelt book and one I wholeheartedly recommend. Back when I hosted a Book Club at my house I tempted my pals over by cooking a meal for them too…always inspired by the book we read and so I thought I would do the same here. And this book, like many I enjoy, talks food throughout but none more so than a tomato stracciatella which is referenced twice throughout the book. The first time it’s made in the Goldman kitchen by John Millet when Katherine first visits them – an outtake from his life in Rome. The second, by Michele, the fascist scoundrel lover who asks Katherine how stracciatella would be translated in English. And this is a truly delicious soup! At the outset let me say this is my kind of food – simple to cook, pretty quick, based on good ingredients and though it’s a soup, it tastes of summer to me. Can I also mention that this is a really cheap meal? It would make a great cold soup too though I think it would be best without the semolina if you’re going to do that. It would be almost gazpacho like. I think it’s fancy enough to serve to friends for a light lunch and as a starter too. I made the soup itself in the morning, knowing we were having a busy day and then made the egg mixture and added that to the reheated soup at dinner time. It’s great midweek fare and I will actually freeze small portions of the soup and do a quarter of the egg mixture to it as we reheat it for an after work meal. Sadly, my kiddos don’t like soup much so it’s a meal for the grown people only. I based my soup on this recipe in the New York Times but of course I couldn’t leave well enough alone so did it with a Cat twist and served it up with some ricotta gnocchi which is one of my favourite things to eat. Heat olive oil over medium heat in a large, solid bottom saucepan. Add minced/chopped (whatever you like to do in your preparation) garlic, cooking for around 30 seconds. Don’t let the garlic burn – keep the heat lower rather than higher. Add the tomatoes and basil sprig. Cook, stirring, until the tomatoes have cooked down – the original recipe said 10 minutes but mine was done much more quickly. Add the stock. Bring to a simmer, cover with lid and simmer 20 minutes. Season to taste with salt and pepper. The soup is essentially done. 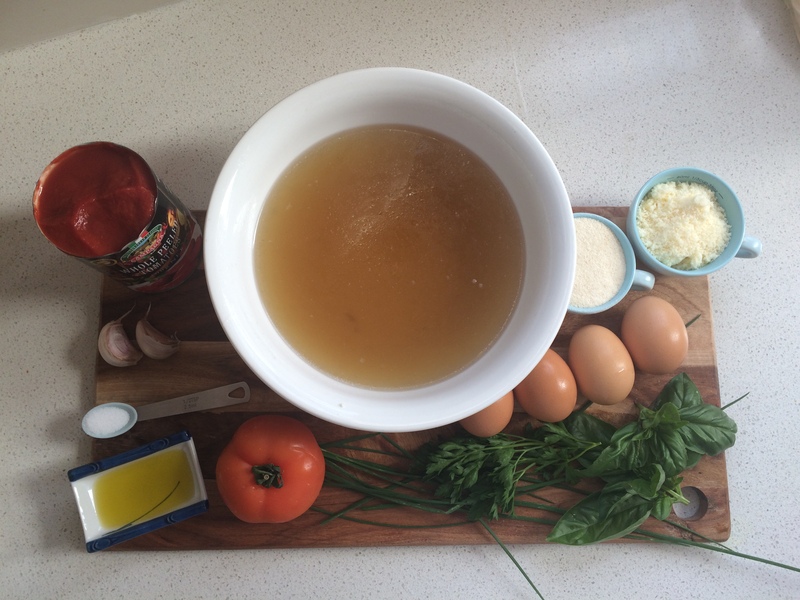 In a large mixing bowl, beat together the eggs, semolina, Parmesan, herbs and a dash of nutmeg. Beat until frothy. Bring the soup to a boil, and slowly drizzle in a thin stream of the egg mixture, stirring constantly. This slow pour is actually what gives it a lovely swirly cloud situation. Then reduce heat and simmer five minutes. I do my gnocchi mostly by feel rather than recipe now as it’s not at all tricky so please go with the instructions rather than the quantities of the flour lovely people. Drain the ricotta in a sieve until most of the liquid has dripped out. Meanwhile, put a large pot of water on to boil. By the time it’s boiling your gnocchi will be ready. Gently mix ricotta, salt and parmesan in a large bowl and add only as much flour as you need to bring the dough together. The best way to do this is to do it by hand – it should be sticky but not so much it sticks to your hands. Try not to overmix it as that makes the gnocchi tough. 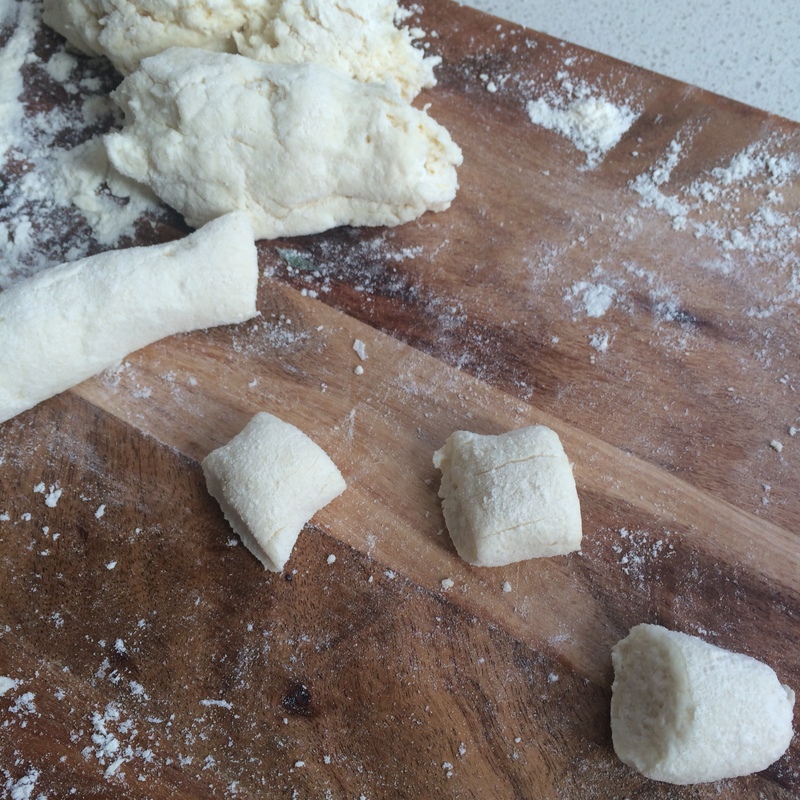 Invert on to a lightly floured board and make sausage like shapes out of the dough – around the 2cm diameter is best. Then cut them in around 2cm intervals. Drop the gnocchi carefully in the boiling water – this is tricky cos you have to be gentle and don’t want to splash yourself with boiling water! The gnocchi cook in a few minutes maximum but when they’re ready they float to the top which is indeed very kind of them. Fish them out with a slotted spoon, I prefer to put them in to a colander to drain the last of the water off. You can cook them in advance and rewarm them or even pan-fry them to give a nice crunch to the outside of it and they do freeze well. Tor freeze, lay them flat and put baking paper between the layers to make sure they don’t stick together. This entry was posted in books, food, recipes on January 5, 2015 by catbeloverly. I love books. They’ve been a constant companion. 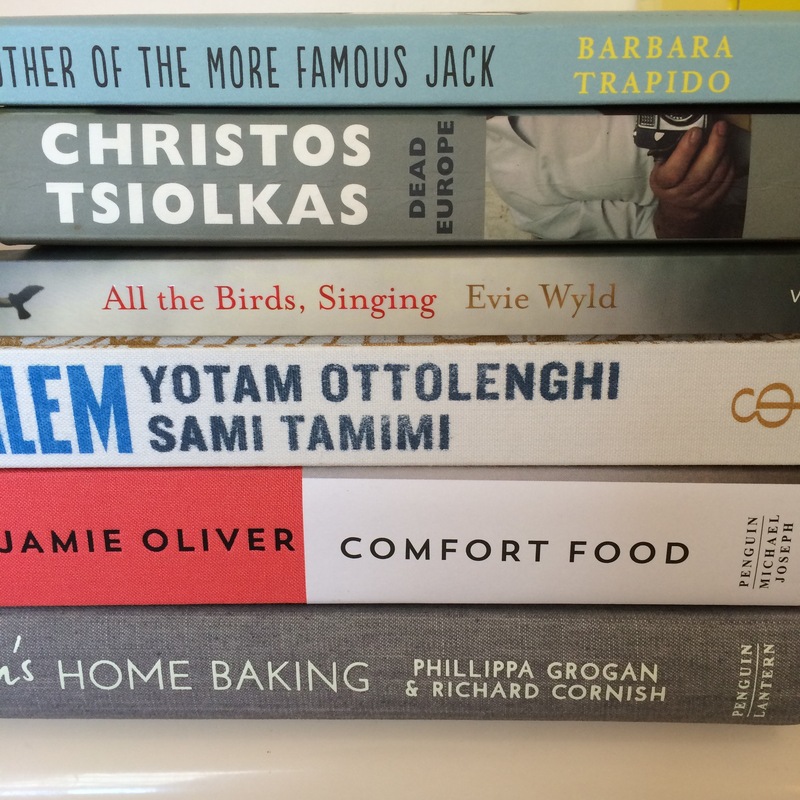 We have four bookcases at home – one solely for cookbooks (and I’ve got some hidden in a cupboard too! ), one full of my books, one for the boy’s books and one with a mix of texts, my books and Mr’s books. The poor fellow hardly gets any space. Books (and maybe shoes) are my ultimate consumer weakness. Though I do love the library too there’s nothing quite like the smell of a new book. The pile of books pictured above is my to be read pile as at last week. I came across this reading challenge late last year and am going to try my best to complete it though at 52 books I know it’ll be tough. I will include children’s books too so it may be achievable! 🙂 I’ll be sharing what I read here. Fun times ahead. If you read anything awesome please do let me know? 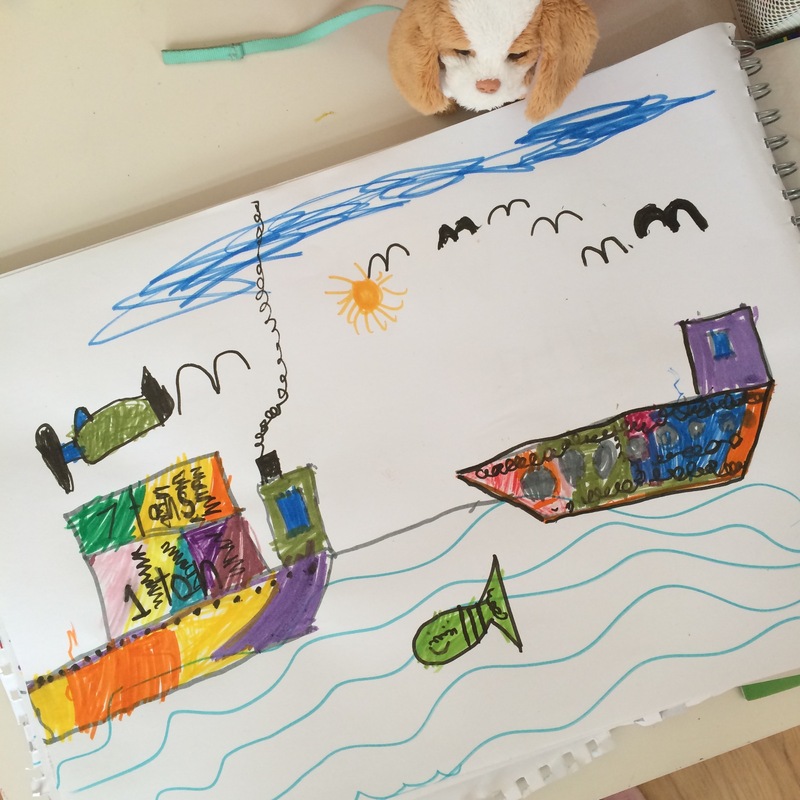 This entry was posted in books on January 4, 2015 by catbeloverly. And food! Lots of good food which nourishes your soul. This entry was posted in Uncategorized on January 3, 2015 by catbeloverly. Since Mr 6 was a trepidatious toddler walking on tiptoes we’ve been doing some advent activities. Every year I say I will blog the activities we do and every year I get caught up and don’t. So I will post our fun in blocks. Our calendar has little pockets in it and I place notes in each pocket (see bottom left picture) saying what each day’s surprise is. It’s a really lovely way to spend some time together and I have very much focused them around things the boys like to do as well as things I want to focus on like giving back, making home made gifts and the like. I’ve been collecting ideas for our activities all year and wrote out the list, sitting with my calendar for December (we have SO many birthdays this time of year too!) and worked out what days would be busy, what days the kiddos would be with Grandma, Mr and me and popped a note in each pocket that fit with the day. – written a letter to Father Christmas including the things that they’re thankful for. This was my favourite so far as Mr 6 helped Mr 3 write his letter and they both carefully considered their content. Their thankful list was also three times longer than what they were asking for. Ace stuff! Do you advent calendar? What’s your favourite thing you do as part of it? 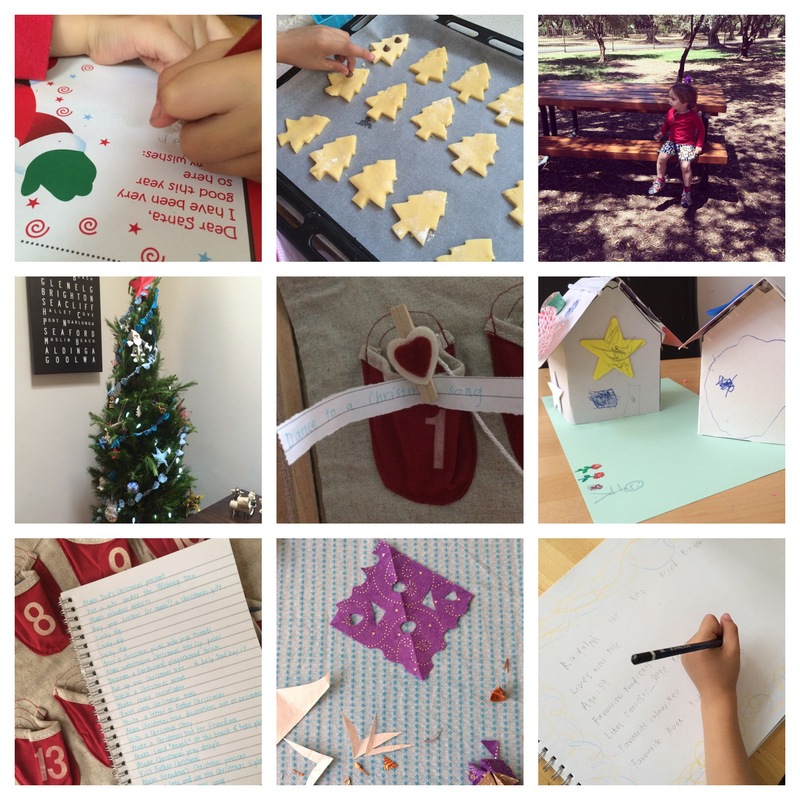 This entry was posted in christmas, kids craft on December 8, 2014 by catbeloverly. There were tears at the breakfast table this morning. At the outset let me say there are often tears at the breakfast table at ours. I was, I think, wholly unprepared for the sheer number of tears my children would shed and over so many different issues before becoming a parent. But toddlers and preschoolers cry a lot it turns out. Even my highly verbal ones. But I digress. This morning’s tears were the sad type. The type of crying we adults do in varying degrees depending on our propensity to leak from the eyes. I leak from the eyes regularly by the way. But I digress. Again. Mr 3 had sought out one of his favourite presents, a torch and it wasn’t working. He cried. Nothing new there. I cuddled him and said it was most likely the batteries and we would seek out a new set and do that as soon as we were finished with breakfast. Of course he wanted it done immediately but before I could say anything further Mr 6 burst in to sobs. Loud sobs at that because the drama king is strong in him. I handed Mr 3 over to Mr and scooped up Mr 6 in my arms. As Mr 6 was crying so much it set his brother off in to deeper tears. Because though they constantly battle over whose way will prevail they genuinely care for one another it seems. I hugged him and stroked my beautiful big boy’s hair. He calmed enough to tell me, through sobs, that the torch not working was his fault. It turns out he had dropped it and had heard a, “really quite crazy tinkly smash sound” (I told you highly verbal right? )….”and because dad had asked me to put the torch down but I ignored him and it broke” he hadn’t wanted to admit it to us. Because really, who hasn’t been there? Not wanting to admit you’ve done a wrong to avoid trouble is something we have all done. There are moments in parenting that feel like a test. This was one. And instead of getting angry with him, as I might have done had he admitted it at the time, I spoke to him instead of how important it is that he tell me things, even if he feels they’re wrong or he will get in trouble. Because he is six after all. I had let him accept his wrongdoing and reassured him I would love him anyway. His internal compass is what I want him to be able to listen to after all. Parenting test 1034 navigated, I wonder what 1035 will have in store? 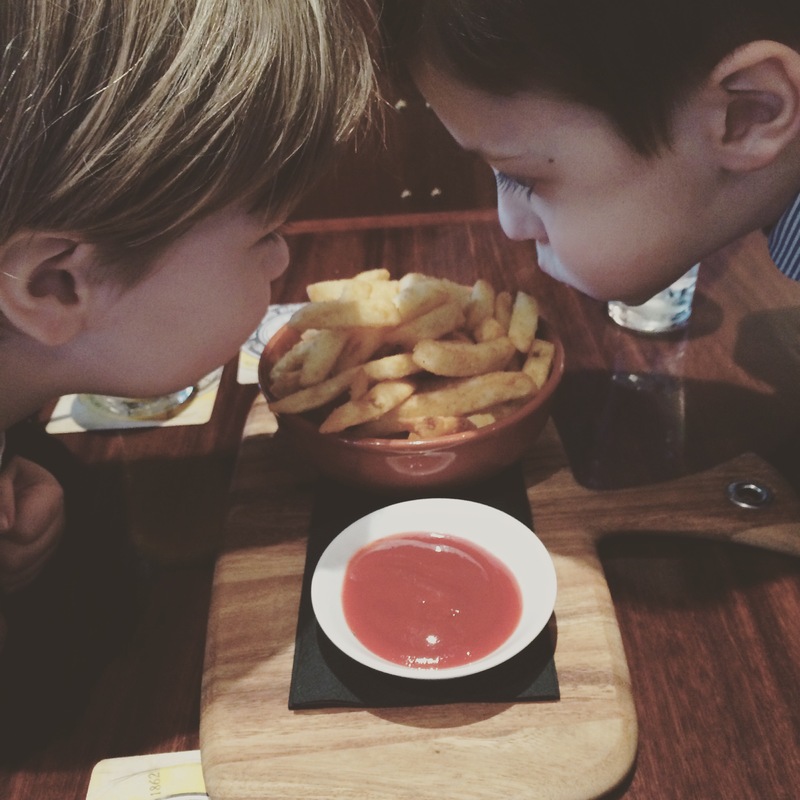 This entry was posted in mama-hood, things i'm learning on November 14, 2014 by catbeloverly.